-At the beginning of this week I got food poisoning and spent a day and a half bouncing from my bed to the toilet to the couch and back and forth and back and forth. blech. 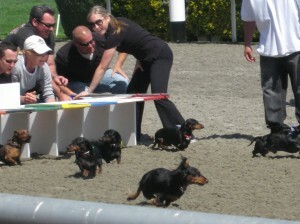 -I’ve been waiting a year to attend the annual dachshund derby, a day at the race track with little wiener dogs racing about 15 feet. Way too cute! 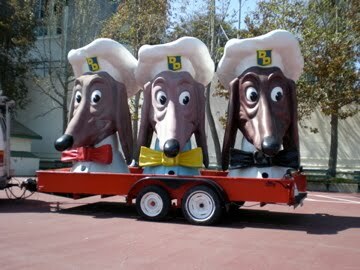 Unfortunately this year the rain washed all the wieners away and the race was canceled. some photos from last year’s derby…cute or cute? Well, after a bout of craziness this week, today was finally the day that I was able to wake up, bake, snap some photos, and, well, eat. 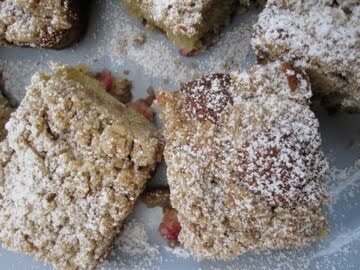 Rhubarb has finally arrived. Rhubarb looks kind of like red celery. While the leaves are poisonous, the red stalk delivers a tart, zingy flavor that is usually incorporated into sweet baked goods. 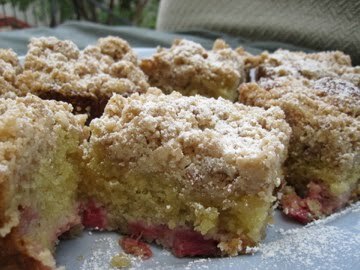 Just please, do not eat RAW rhubarb. No good. No no. Just don’t. Come eat my cake instead. At work, we are currently serving rhubarb jam with toast in the morning and panna cotta with wine-poached rhubarb as one of our evening desserts. My ideal Sunday starts off with a big breakfast baked with love. Whether it’s pancakes, waffles, eggs n’ toast, or some sweet treat (or all of the above !!) , I am always a happy camper. Really, though, the best is when I get to make breakfast for/with others, because those smiling faces and satisfied bellies are all I need in return. 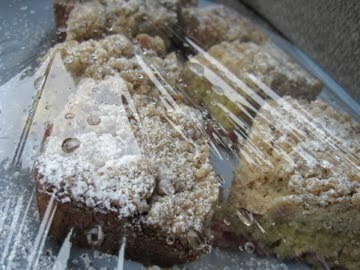 This coffeecake even survived the rain today. Now that’s sayin’ somethin’. 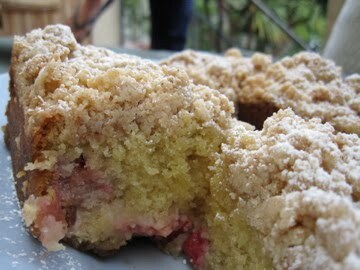 Now friends, I have often pondered this question myself: why do they call it coffeecake if there is no actual coffee in the recipe? 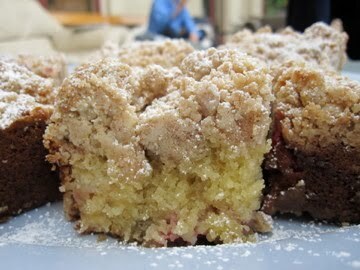 Well, coffeecake falls under a class of cakes intended to be served with coffee or for similar breaks and snacks. So there you have it. 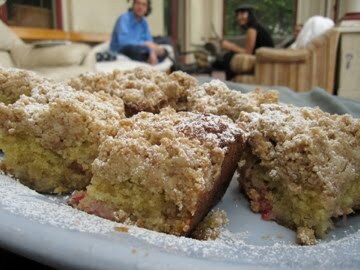 Oh, and on June 9th, look out because apparently it’s national Strawberry Rhubarb Pie Day. Just thought I’d let you all know in advance. 3. To prepare cake, in a small bowl, stir together the sour cream, egg, egg yolk and vanilla. Using a mixer fitted with paddle attachment, mix together flour, sugar, baking soda, baking powder and salt. Add butter and a spoonful of sour cream (or yogurt) mixture and mix on medium speed until flour is moistened. Increase speed and beat for 30 seconds. Add remaining sour cream mixture in two batches, beating for 20 seconds after each addition, and scraping down the sides of bowl with a spatula. Scoop out about 1/2 cup batter and set aside. 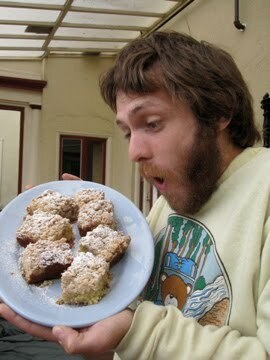 Give the cake a nice lil’ dusting of powdered sugar, too. It makes makes it just that much better.